The Patriots were led by Major Light Horse Harry Lee, and launched a nighttime raid on the British-controlled fort in what is today downtown Jersey City. They surprised the British, taking 158 prisoners, and withdrew with the approach of daylight. Despite retaining the fort and its cannons, the British lost much of their control over New Jersey. Lee was rewarded by the Second Continental Congress with a gold medal, the only non-general to receive such an award during the war. Armies - American Forces was commanded by Maj. Henry Lee and consisted of about 300 Soldiers. British Forces was commanded by Maj. William Sutherland and consisted of about 250 Soldiers. Casualties - American casualties were estimated to be 2 killed, 3 wounded, and 7 captured. British casualties were estimated to be 50 killed/wounded and 158 captured. 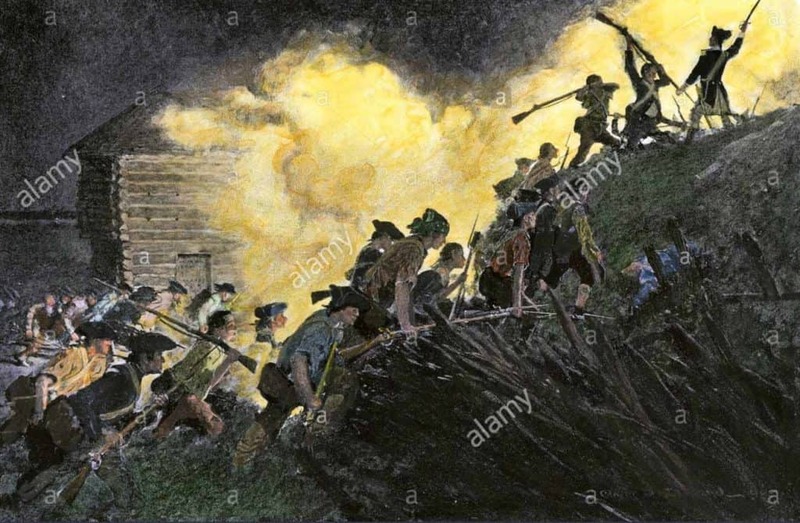 On August 8, at 4:00 PM,, Lee, with 400 infantry and a troop of dismounted dragoons, started from New Bridge (now River Edge, New Jersey), on a march of 14 miles through the woods to make an attack upon the British fort at Paulus Hook. 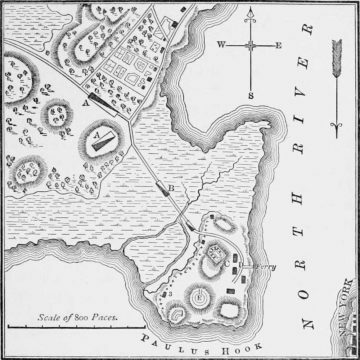 He detached patrols of horse to watch the communication with the North River and stationed parties of infantry at different roads leading to Paulus Hook. At Union Hill, Lee filed into the woods where by the guide's timidity, or treachery, the march was prolonged to three hours before gaining the right road. 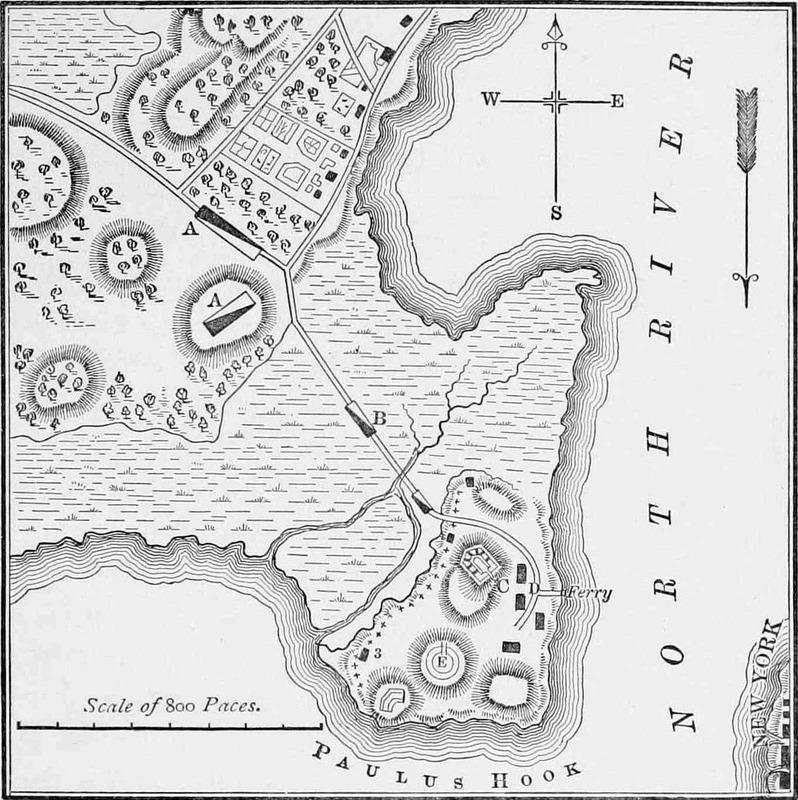 The same night, Colonel Van Boskirk left Paulus Hook with a force of 130 men to make a raid upon the neighborhood. Fortunately, the two parties did not meet. On August 19, Lee and his men reached Prior's Mill at 3:00 AM. At 3:30 AM, they reached the ditch at what is now the intersection of Newark Avenue and Warren Street. The tide was rising but Lieutenant Rudolph found the canal fordable, and led by Lieutenants McCallister and Rudolph, the troops pushed through and soon gained possession of the outer fort. Major Sutherland, who was in command of the fort, retired into a small redoubt with a few officers and 40 Hessians. It was nearly daylight and Lee had no time to dislodge them. He had intended to burn the barracks, but on finding sick soldiers, women and children in them he refrained. He retreated, carrying with him 159 prisoners, officers and men. He lost two men killed, and had three men wounded. Captain Forsyth was ordered to Prior's Mill to collect such men as were most fit for action and take a position on Bergen Heights to cover the retreat. This position was in the woods near Bergen and Sip Avenues. The troops remained there until messengers had been sent to ascertain if the boats that Lee had arranged to have in waiting for him at Dow's Ferry were there. He had intended to cross the Hackensack River and by the Belleville Turnpike reach the high ground east of the Passaic River, and thus return to New Bridge. The boats had been removed to Newark and Lee with ruined ammunition and tired men, encumbered with prisoners, was obliged to return by a route liable to be interrupted by troops from New York City. With undaunted courage and wise precautions the brave troops started on the return march of 14 miles to New Bridge; at "Weehock" (today's Weehawken) Captain Catlett came up with 50 men and good ammunition. At the Fort Lee road, Colonel Ball met him with 200 fresh men, and Lee and his men safely reached New Bridge about 1:00 PM. The British were greatly annoyed and the Americans exceedingly jubilant over the affair. In a letter to Congress, General George Washington said: "The Major displayed a remarkable degree of prudence, address and bravery upon this occasion, which does the highest honor to himself and to all the officers and men under his command. The situation of the fort rendered the attempt critical and the success brilliant."